Heat oil in a pan and then fry the potato slices till golden brown. Meanwhile cut the chicken into small pieces and keep aside. Heat olive oil in a kadhai/wok/pan and then Add the onions and capsicum. Saute till the onion turns soft and then add the chicken pieces and again cook for 2 minutes . To this add the vinegar and soya sauce.Add salt.Remove from fire. Spread the tomato sauce on the pizza base and then place the fried potato slices on the sides of the pizza . Then spread the chicken mix evenly on top of it. Now place the cheese strips all over the chicken mix . 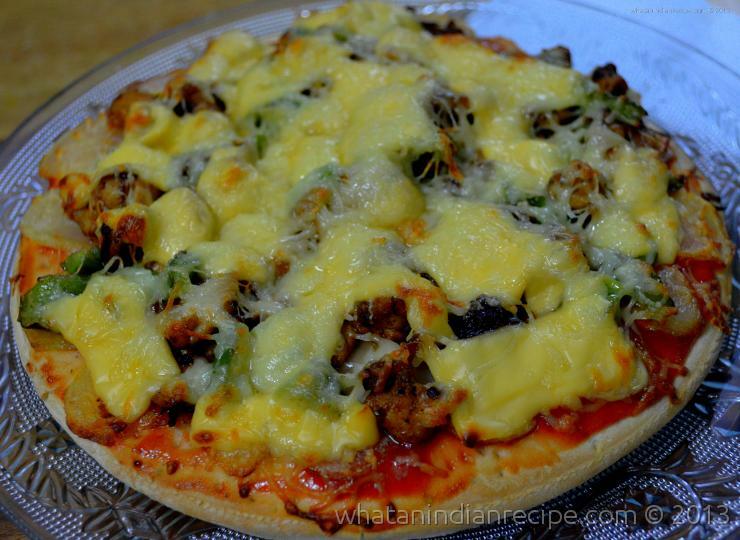 Finally spread the the grated pizza cheese on it to cover the chicken mix. Bake it in a preheated oven for 10 minutes or till the cheese melts fully.